The China Central Television (or CCTV) Headquarters is situated within an unusually-shaped skyscraper in Beijing’s central business district. This seemingly gravity-defying structure was designed by the Dutch architect, Rem Koolhaas, and is made up of two leaning towers joined at the top and bottom, creating an irregular grid with an open center. The building’s distinct shaped has earned it the nickname, ‘Big Underpants’ among Beijing locals. While visitors are not allowed access to the CCTV Headquarters, the outside of the building is an attraction in itself. Security remains tight, particularly after fireworks during the Chinese New Year festivities of 2009 caused a fire in the Television Cultural Center, which sits adjacent to the main building. 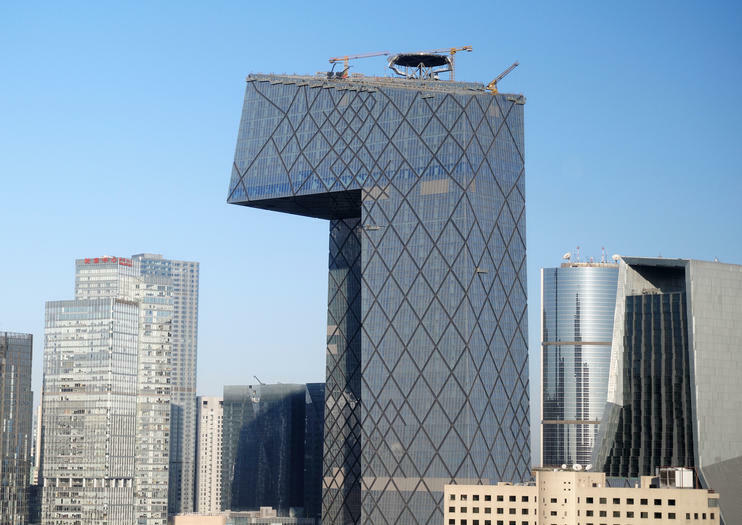 The CCTV Headquarters are located at 32 Dongsanhuan Middle Road in Beijing’s CBD. The nearest subway station is Jintaixizhao. There’s no better way to see Beijing by night than from a car. This private transport service ensures you see the sights—and the lights—without struggling with taxis or waiting for strangers. Following a fixed itinerary with photo stops, discover Beijing ancient and modern—from the Forbidden City to the Olympic site, from Back Lakes to Rem Koolhaas’ CCTV building. Savor a Mongolian-themed ‘yurt’ tent dinner, tour the Central Business District (CBD), and enjoy a glass of craft beer on this private 4-hour Beijing night tour. Enjoy a traditional Mongolian dinner in an authentic-style yurt before a panoramic sightseeing tour of the CBD’s illuminated landmarks. Finally, visit the hip Sanlitun nightlife quarter for a craft beer at the trendy Jing-A Brewing taproom. Your experience includes dinner, beer, and central hotel pickup and drop-off. "Jiaozi" in China represent wealth or luck. Tonight, you will have dinner at one of the most famous dumpling restaurant in town, choose one or two city landmarks to visit in town, and enjoy a glass of craft beer at the trendy Jing-A Brewing taproom. Choose the city landmarks you want to see at night, such as CCTV building, Tian'anmen Square, National Theatre, Houhai lake area , Wangfujing Street and so on. Your experience includes dinner, beer, English speaking tour guide, private vehicle and central hotel pickup and drop-off. Join this private 4-hour evening walking tour to explore the illuminated beauties of the Beijing Business District and experience the art of Chinese flower arrangement at a hands-on class in the personal studio. Highlights during your panoramic tour include CCTV building, The Place Mall and Silk Market. Finally, stroll around the Ritan Park to join the locals evening exercise. With your private tour guide and private vehicle, see Beijing when it sparkles - Beijing Central Business District, the famous Rem Koolhaas's CCTV building, the magic giant LED Screen at the Place, Tiananmen Square, National Opera House - the "eggshell" by French Architect Paul Andreu, Wangfujing Night Snack Food Street, Houhai Lake Bar Street. Hear stories about Beijing's history and contemporary life from your informative guide. Enjoy a delicious dinner in the restaurant where the locals go and then relaxing your body, mind, and soul in Chunhuiyuan Hot Spring. Spend 3 hours explore top night attractions such as night Tiananmen Square, Board the 268-meter Olympic Tower , overlooking the series of pearl lines whole marvelous view of night Beijing. See night colorful Bird's Nest, Water Cub. Experience the world's largest LED screen at World Trade center area (The Place) to see the light show with mysteries of the vast ocean stories. Hotel pickup and drop-off, tickets to the 268-meter Olympic Tower (Nail Tower ) are included. Explore Beijing at night with this 4-hour, private tour with chartered boat at Shichahai Lake area. Travel by the illuminated attractions such as the Tian'anmen Square, Wangfujing Street, National Theatre, The Houhai Lake, The CCTV Building and The Place Mall with Huge LED TV screen roof. Listen to commentary about the city and its history as you go. Then head to Shicha hai Lake area to board your chartered boat. Sip tea and indulge in some snacks while floating along to Houhai Lake. Hotel pickup within the 4th ring road and transport by private vehicle are included.